Ok, since alot of questions have been going around, I thought I would make this to keep them all in one thread..
Any modeling questions can be posted here, about any modeling program, I know the are experts here on the GWBB regarding all programs. Ok, this is an example of 1st pic: Combine and 2nd pic: Bridge. Thanks to the wonderful FAQ by karajorma, I have figured out a fair bit of modding my own ship. Im now aiming to work with textureing my new craft. The thing is, i designed my ship in 3d studio max and used the pof exporter to create a pof. I then tried to use Lithunwrap to create a uvmap texture that i could edit in photoshop. But altho lithunwrap can import a pof, it doesnt seem to export a pof. Any of the other export options just loose all my helpers and points. I then tried a method of using uvunrwap within 3dstudio max. This can give me a map, but i can seem to export it for use in photoshop. The only way i can get it to work is to take a screenshot of the map and then paste it into photoshop and work with it from there. Altho this does seem to work, its not terribly acurate and im sure there must be an easier way? Any help would be greatly received! While in Lith,have you tried to export to .cob, and convert with POFCS? But it looses all my gun placements and thruster markers etc. I know i can reset these in POFCS but i find it easier to get the placements set up using 3dsm. You can re-import all that pof data from your original pof via PCS as well. It's in Misc>Global Data Import. However, it's definitely more efficient to get *all* the modeling and texturing done before you even do the turret geometry placement, let alone the pof data. I believe Killfrenzy did one or more of their ships a long while back. No idea where you'd find a link though. Question 1: With 3.6 scp tables. Can I define a unit as only beign able to Move x,y, (and maybe Z) but NOT have bank/roll? This is for the future non-flying mechs/especially ground based destroids. I am awaiting final confirmation from Mulder, but that is how I advised him to proceed for a mech model test. What you go on vacation or something? Anyway I wasted the whole day trying to figure out what I was doing wrong with turrets (going by Karajorma's tutorial) I found the axis button and thought I did them right. Anyway what is wrong with this turret? The first problem was that you had each separate barrel as a separate geometries with individual lights glued to them. This makes FS see each barrel as a separate subobject. Then the base geometry is glued to another light, making the base geometry appear as a subobject of the base group - thus the game could easily mistake it for another barrel, because it's set up exactly like one. The way to get this is to go pretty much from the bottom up. You do this by starting with the barrels - they should consist of a single chunk of geometry glued as a sibling to a light. You then glue this whole newly created group to the base geometry as a child. The easiest way to accomplish this is to simply drag the "turret02-arm" group on top of the "base02" geometry in the heirarchy window. Once that's done, you'll have what you see in the above pic, except the turret02-FP01 & 2 lights will still be separate. Drag them individually over the "turret02-base" group, and it should put them in the same heirarchy level as the base geometry (ie gluing them as a sibling to the base). It does.. I got confused in the tut and opened a FS model to see the how the submodels looked, rotated ect..
A light glued to the hull isn't nessecary if the hull already has any sort of child subobject (turrets, radar, debris, lods etc). PCS works that bit out on it's own. The boolean union is the Object Union tool - usually I would avoid it, but it's really the only thing you can use in truespace to accomplish this particular task. 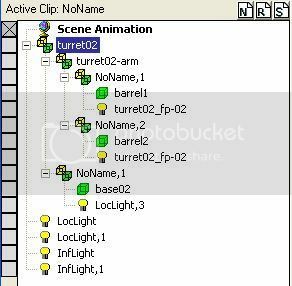 Not sure which version of TS you use, but in mine the Boolean tools are in the middle left of the bottom main control pannel - their icons involve green and red spheres. 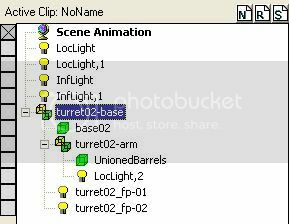 To use, simply select the first barrel's geometry, click the 'Object Union' button, and then click the second barrel's geometry. 1) Dragging and dropping an existing object group onto another object or object group will make the first group a child of the second one, meaning it is on the heirarchy level below it's parent. 2) Dragging and droping a single object (ie, a single light or geometry) onto another object or object group will make the first object a sibling of the second, meaning it is on the same heirarchy level as the first. To glue turrets to the model, you will be performing type 1 - since the turrets must be children of the main hull. In this case you'd drag the whole turret object (ie, the highest level of the turrets heirarchy) over the main hull geometry/object group. Another handy thing I've learned is that when you've finished with your heirarchy and are ready to convert, select something other than your ship and then re-select your ship on it's highest heirarchy level. I don't have a clue what this does, but I recall it being the difference between a PCS crash and successful conversion with a really old model, so I've done it ever since, just in case. Got anotehr quick turret question. I got a ball turret type that is a small hemisphere that has texture based firing points Can you make the base alone rotate as the firing point will have a restrictive arc that simulates elevation but really doesn't need any movement on the X axis.. Or do I still need to make a invisible arm? basicly this is a single part turret that merely rotates on the Z axis... Doable? Do you really need to union turret barrels? I've always just put both of them as a child of the turret base along with two firing point lights.